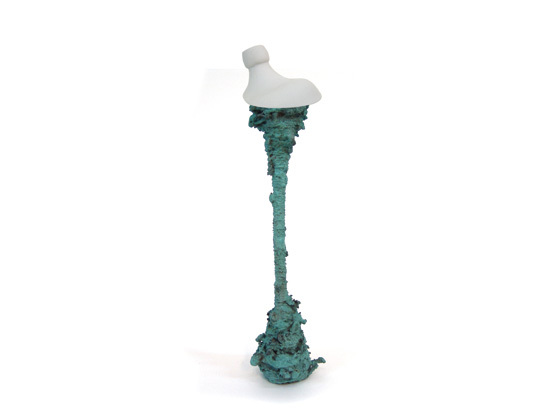 The Settlements series of objects were created for the Jerwood Contemporary Makers Prize 2009. The project is being developed in collaboration with marine biologist Dr. Joanne Porter from Aberystwyth University and is part of Julia Lohmann’s ongoing investigation into man and marine life. I am fascinated by undervalued natural and manmade materials. In my work I explore how we relate to them on a cultural, functional and emotional level, what we find beautiful, precious and what worthless. Along the way I want to raise questions about how our material relationships fit in with the bigger picture – the world that sustains us – and how we can make our co-existence more sustainable. A lot of my work is based on first-hand exploration and whatever I find will be probed for its potential as a design material. The outcomes of these investigations are objects and installations. Among them are ‘Ruminant Bloom’, flower-like lamps with a billowing honeycomb surface, made from preserved cow and sheep stomachs and installations like ‘The Catch’, a barren seascape made of fish crates from the fish market of Sapporo, Japan, reflecting on the overfishing of the oceans. During my research into the relationship of man and marine life and possible applications for kelp as a design material I came across Bryozoans, tiny animals that colonise kelp as well as flotsam and jetsam. They create beautifully detailed, calcified skeletons with mesh and cell-like surfaces. Together with their manmade ‘habitats’, Bryozoa became the starting point for ‘Settlements’, the objects in this exhibition. The Settlements on show are made from a range of materials, from plastic to porcelain and black clay to bronze. They are flotsam and jetsam hybrids, both manmade and organic, parts of which are submerged in seawater tanks to allow Bryozoa to settle on and co-design their surfaces. The resulting objects provide a glimpse of what is happening within the vast islands of rubbish floating in the remote areas of the world’s oceans, where nature is converting manmade objects into new habitats and vessels that are spreading organisms across the globe at unprecedented speed and scale. I would like to thank the Jerwood Visual Arts for selecting me for the Jerwood Contemporary Makers Prize 2009, thereby giving me the opportunity to realise the ‘Settlements’ project. Like most of my work, ‘Settlements’ is a collaborative project which would not have been possible without the help, support and expertise of Dr. Joanne Porter, Dr. Helen Marshall, Jen Jones and Emily Lambourne at Aberystwyth University; Dr. Ann-Margaret Amui at the National University of Ireland in Galway; Dr. Mary Spencer-Jones at the Natural History Museum; Gero Grundmann, Victoire Cattin and Laurie Dickason at Studio Bec; Karen Price at the Royal College of Art; Chris Summerfield, Sian O’Keefee, Kate Hobby, Sarah Pirkis, Maxine Nelson, and Laurence Edwards at Butley Mills Studio; and Wayne McKinney at Norwich University College of the Arts – Thank you!